About Organization: National Accreditation Board for Testing and Calibration Laboratories (NABL) is an autonomous body under the aegis of Department of Science & Technology, Government of India, and is registered under the Societies Act 1860. NABL has been established with the objective to provide Government, Industry Associations and Industry in general with a scheme for third-party assessment of the quality and technical competence of testing and calibration laboratories. 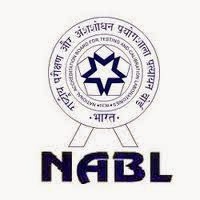 Government of India has authorised NABL as the accreditation body for Testing and Calibration Laboratorie.